Football fans will soon be packing up for a trip to Atlanta to watch the undefeated Rockmart Yellow Jackets play in the state championship game. Yet with the game scheduled for the middle of the day during the school week, how can students enjoy the game too? Well, the Polk School District has stepped in as of Saturday morning and decided that schools across Polk County will be closed on Wednesday, December 12 to accommodate the game being played at 1 p.m. at Mercedes-Benz Stadium instead of this coming weekend, when it would have been scheduled if not for Atlanta United's finale being a home game too. Georgia High School Athletic Association officials made the call to change the dates and push back five days before Rockmart's semifinal win last Friday night over Callaway, and that prompted the closure of school. Superintendent Laurie Atkins sent out a statement on Saturday morning that it would not be a day that students have to make up either, since the school district hasn't yet been forced to close for any weather-related issues in the 2018-19 school year. "Therefore, we feel that cancelling school on Wednesday is our best option," Atkins said in the statement. "This allows us to provide the supervision needed for travel and for the stadium event." Polk School District will be utilizing buses for the trip to the championship game, and would also have problems getting substitute teachers to cover for coaches who would be participating in the game. She added in her statement it gives everyone a chance to enjoy watching Rockmart play against Heard County in the Dec. 12 rematch between the two teams. The two teams played earlier in the season, but the game was called at halftime for a Rockmart win after a lightning delay forced both teams back into the locker room. Atkins did say in the statement the district does give its apologies for anyone who experiences hardship over the decision. "It is the desire of the district to notify everyone early in order to make plans for all children," she said. Her statement ended with heartfelt hopes for Rockmart in the coming days as they prepare for their historic state title game, the first since the 1950s. "As you take the field at Mercedes-Benz Stadium, take in the entire experience," the statement read. "You have attained what every high school team in the state dreams to achieve. Your community is behind you and will be rooting you on to victory." Those who want to know more about ticket sales for the forthcoming game can get pre-sale tickets at $22 starting on Monday through the high school, and they are $30 the day of at the stadium. Call the school at 770-684-5432 for more. They are also available at Raceway in Rockmart, City Body, Rockmart Florist and Whiteheads Florist. The downtown skyline in Rockmart is about to see a big change as the city plans to bring some additional light on Marble Street in the first phase of a project to attract customers to businesses. The City of Rockmart is providing residents with a year-round string lighting above Marble Street and will add lights to the top of the Rockmart History Museum building to complete the first step in attracting people to the downtown area once the sun goes down. Its part of improvements suggested by the Downtown Comeback program visit, and will be paid for by the city. The expected cost is around $10,000 once electrical work, installation and the lighting itself is purchased according to the City of Rockmart's Stacey Smith. She said a survey of the street expected 200 feet of lighting to be installed on Marble Streets first, then more to be added. The two sections of the street will be divided by the museum, which itself will be wrapped in lighting all the way around the roof line. The City of Rockmart's Stacey Smith described the lighting going in a zigzag pattern taking up a 400 feet of air space along Marble Street, as well. "They have to be more than 13 feet above for clearance purposes," City Manager Jeff Ellis explained. "Also they're hung on aircraft cable, so it'll be strong and hold up." Side portions on Church Street will not get lighting in this first phase, but will come in a second later on when funds become available to expand. Businesses will have to agree to allow for mounting and electrical to be completed before the project is undertaken, an effort that began last week after the Downtown Rockmart Advisory Committee meeting was held for the Chamber last week. That committee – formerly the Rockmart Business Alliance – will use some of the funds leftover from the previous organization to help cover the cost of the materials in the project, reducing the amount taxpayers will have to pay up front. Sales of the snowflake lights from Christmas decorations past in Rockmart are also going to contribute to reducing the cost to the city for installing the lighting. City Manager Jeff Ellis said his hopes were that they would complete the lighting project and have an event before year's end to usher in the change to the downtown area. Chamber Executive Director Blair Elrod added that it was her hope this would be the first of many projects to come out of the Downtown Comeback event in September. The City of Cedartown is also looking into taking similar steps in installing year-round string lighting over Main Street, but no official announcements of their plans have been made yet. Discussions were ongoing as of their November work session on getting it underway. The committee also agreed to use fund from the Rockmart Business Alliance to cover the cost of signage to direct people off Highway 278 into the business district, a project that is underway as well. The state's Department of Transportation did get permission to put up new City of Rockmart city limit signs designed by the city in place of the green signage already used, but will need to get additional permission, which Smith said is something that is being considered. City officials and the committee are hoping that DOT will give them permission to replace signage directing people downtown with something more akin to what Rome has, with additional colors and not rely on the signage the state provides that is felt to be "cluttered." Check back for more on the forthcoming lighting project in Rockmart and celebration of the installation as plans come together. Snowflake lights which used to decorate the city during the holidays are a piece of Rockmart history available for purchase this Friday. Remember the old days, when the City of Rockmart used to put up snowflake Christmas decorations on power poles around town? Those were replaced a few years back with more variety of holiday decorations and now what remains of those past light displays need a new home. A chance to own a piece of Rockmart history is coming this Friday as the snowflake lights are being sold by the Polk County Chamber of Commerce's downtown Rockmart Advisory Committee from 10 a.m. to 2 p.m. in an effort to help raise money for the downtown Rockmart lighting project. The snowflakes are being donated by the city to the committee to help cover the cost after they decided they wanted to do something with the lights other than scrap them for the metal. Rockmart City Manager Jeff Ellis said the lights were still in good condition and many still worked when plugged in. However there are others in the collection of 41 available for sale that will require some restoration work, and that LED lights that stick on from various local stores can replace the old, less efficient lights. The lights first went up in the late 1970s and were used for decades as holiday decorations along light poles in Rockmart. They were replaced in 2014. During the late November Downtown Rockmart Advisory Committee meeting last week, they worked out pricing and availability for the Snowflake lights. Prices are one each for $100 and 2 for $175 in as-is condition. They'll be sold at the Rockmart City Complex. The lights themselves aren't small, and those interested should bring a truck to pick one up. They measure 76 inches by 75 inches. Those interested in seeing examples of the lights can stop by the old Hometown Realty office on South Marble Street, the Silver Comet Trailhead office, or Now and Then on East Church Street. Anyone interested in reserving a snowflake before the Friday sale on a first come, first serve basis can contact Elrod at the Chamber at info@polkgeorgia.com, or by calling 678-883-9255. Apache Troop of the 108th Cavalry in the Georgia National Guard stood at attention and ready for a command during a sendoff ceremony held on Nov. 26. Members of the 108th Cavalry Apache Troop stationed out of the Georgia National Guard Armory in Cedartown listen to State Rep. Trey Kelley address the company and their family and friends during a Nov. 26 sendoff ceremony. Citizen soldiers donned their uniforms and marched onto the stage of the Cedartown Performing Arts Center for a ceremony to wish them a safe deployment as they prepare to head overseas in 2019. Harm's way will be found in Afghanistan as Georgia National Guard members prepare for a third trip to the war-torn country in 12 years. Apache Troop of the 1-108 th Cavalry, a unit of the 48 th Regiment in the Georgia Army National Guard gathered on Monday, Nov. 26 as they went off for one last training deployment to last until Dec. 21 before they are sent off to a combat tour overseas. Family and friends joined in the ceremony that included addresses from State Rep. Trey Kelley (R-16 th District,) The Rev. Ed Dickens, a retired Lieutenant Colonel and now pastor of Anna Kresge United Methodist Church, and retired Command Master Sergeant Paul Redgate. Kelley said he wished the troops a safe journey to war and back and thanked them for their service and the great honor he feels having the chance to just be with Alpha Troop before their deployment. "Our nation is one founded on grand ideals," Kelley said. "We're a nation that's founded on life, liberty and the pursuit of happiness, on the principal of all men are created equal... those were groundbreaking words, words that changed the course of history. But if it had not been for soldiers who had taken up the fight to gain us our freedom, those words would be worth nothing more on paper than the one I hold here." He reminded Troopers that much like those chosen to serve with Gideon in the story from the Old Testament book of Judges, they too were called upon by God to defend the United States. "Whatever has happened in your life, whatever choices you made that brought you here, God has chosen each and every one of you to serve his purpose," Kelley said. Lt. Col. Ed Dickens (Retired) also spoke, and though he said he's usually the preacher among the group as the pastor of Anna Kresge United Methodist Church, he instead brought with him words of advice about what he learned from his own service. He called upon the young troopers of the 108 th to remember to listen to the non-commissioned officers and leaders in the field, as they have built up years of experience gained through a rebuilding of the Army. He said that process began from when his service started in the late 1970s, to when it ended as the head of the ROTC program at North Georgia University after the Gulf War and into the early 2000s. He also called on the community and loved ones to act as a support system for the troopers heading into the field. "I know well, my wife reminds me often how many times I left her and how many times I left them (my children)," he said. "It's important to support the ones you loved while on deployment." Redgate, a Korean and Vietnam War veteran and retired Command Master Sergeant, spoke of his experiences in war. He told the Cavalry unit gathered they were going into combat having some of the best equipment available in the world, which wasn't always the case. He recalled going to war in late 1950 into Seoul with World War II equipment and not knowing whether he and his fellow soldiers would survive. Redgate asked for all to remember Apache Troop in their prayers as they got ready for their deployment in 2019. The ceremony was originally planned to be held at the National Guard Armory on Highway 27 south, but was moved to the Cedartown Performing Arts Center to allow for more people to participate. Colleetoe Sanders provided renditions of The National Anthem and "God Bless America" during the ceremonies as well, leading the audience in the latter song. McKenna promised that no matter what, they would bring every member of Apache Troop back home from their deployment. Cedartown City Manager Bill Fann wrapped up his closing remarks with a command to Apache Troop's Commander, Capt. Brian McKenna: "Take them to war." War is where they'll end up. Apache Troop's move overseas is part of a larger deployment of the 48 th Infantry Brigade Combat Team to Afghanistan, their third overseas deployment to central Asia. They previously were deployed in 2009-10, and 2005-06. 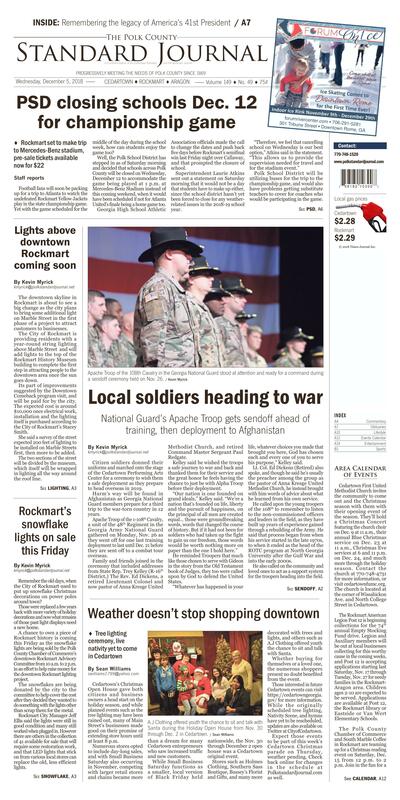 Apache Troop's roster of more than 80 men and women are part of a force of nearly 2,000 from the Georgia Army National Guard, with other armories based out of Calhoun, Canton and Dalton. The mission according to previous reporting in the Rome News-Tribune is security-focused. "We're going to be charged with keeping certain people safe," Major Will Parker said in a September story. He also stated at the time the unit may participate in other undisclosed missions during the deployment. A.J Clothing offered youth the chance to sit and talk with Santa during the Holiday Open House from Nov. 30 through Dec. 2 in Cedartown. Cedartown's Christmas Open House gave both citizens and business owners a head start on the holiday season, and while planned events such as the tree lighting may have been rained out, many of Main Street's businesses made good on their promise of extending store hours until at least 8 p.m. Numerous stores opted to include day-long sales, and with Small Business Saturday also occurring in November, competing with larger retail stores and chains became more than a dream for many Cedartown entrepreneurs who saw increased traffic and new customers. While Small Business Saturday functions as a smaller, local version of Black Friday held nationwide, the Nov. 30 through December 2 open house was a Cedartown original event. Stores such as Holmes Clothing, Southern Sass Boutique, Bussey's Florist and Gifts, and many more decorated with trees and lights, and others such as A.J Clothing offered youth the chance to sit and talk with Santa. Whether buying for themselves or a loved one, the numerous shoppers present no doubt benefited from the event. Those interested in future Cedartown events can visit https://cedartowngeorgia.gov/for more information. While the originally scheduled tree lighting, Nativity Scene, and hymns have yet to be rescheduled, updates are also available on Twitter at CityofCedartown. Expect those events to be part of this week's Cedartown Christmas parade on Thursday, weather pending. Check back online for changes in the schedule at Polkstandardjournal.com as well. Cedartown First United Methodist Church invites the community to come out and the Christmas season with them with their opening event of the season. They'll hold a Christmas Concert featuring the church choir on Dec. 9 at 11 a.m., their annual Blue Christmas service on Dec. 23 at 11 a.m., Christmas Eve services at 6 and 11 p.m. on Dec. 24, and much more through the holiday season. Contact the church at 770-748-4731 for more information, or visit cedartownfumc.org. The church is located at the corner of Wissahickon Ave. and North College Street in Cedartown. The Rockmart American Legion Post 12 is beginning collections for the 74 th annual Empty Stocking Fund drive. Legion and Auxiliary members will be out at local businesses collecting for this worthy cause in the coming weeks, and Post 12 is accepting applications starting last Saturday, Nov. 17 through Tuesday, Nov. 27 for needy families in the Rockmart-Aragon area. Children ages 2-10 are expected to be served. Applications are available at Post 12, the Rockmart library or Eastside or Van Wert Elementary Schools. reading from "The 12 Days of Christmas in Georgia" by author Susan Rosson Spain at the coffee shop at 212 S. Marble St., Rockmart. The first 100 children who come to the event get a free copy of the book, provided by Oglethorpe Power. Contact Chamber Director Blair Elrod for more at director@polkgeorgia.com. Anna Kresge United Methodist Church is planning their children's Christmas play "Christmas Around the World" on Thursday, Dec. 13 at 6:45 p.m., along with an interactive play for all for "Las Posadas" on the same night. The church's other holiday festivities include their Dec. 23 men's play "It Came to Pass" and their Dec. 24 Christmas Eve candlelight and communion service at 7 p.m. The church is located at 15 Booger Hollow Road, Cedartown. Call for more information at 770-748-4308. A live nativity is coming up as Collard Valley Baptist and Antioch Baptist Church team up to present the story of the birth of Jesus during an evening event at Camp Antioch on Sunday, Dec. 16. Both churches will be holding the nativity from 3 to 8 p.m., and free admission is offered for those who bring a canned food donation or love offering. Visit antiochcedartown.com for more information. The next West Georgia Spay/Neuter Clinic is coming to the Cedartown-Polk County Humane Society again coming up this Wednesday, Dec. 5, 2018. Head over to the organization's office at 608 Adamson Road, Cedartown, on Fridays from 4 to 7 p.m. or Saturdays from 10 a.m. to 1 p.m. to fill out an admission and prepay for the surgery. Those wanting more information can call 678-361-7304 for more information. Vaccines and tests are available for extra cost as well. Transports won't be scheduled again until Dec. 19.